Corns generally occur on the tops and sides of the feet. A hard corn is a small patch of thickened, dead skin with a central core. 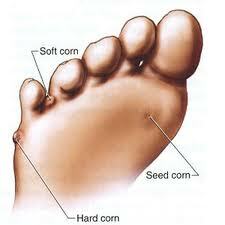 A soft corn has a much thinner surface and usually occurs between the 4th and 5th toes. Ø The foot nurse may perform comprehensive debridement and enucleation (removal) of corns. Ø Apply padding to provide immediate relief. Ø Recommend footwear changes and recommend custom-made foot orthotics as needed for long-term control and prevention to help compensate for mechanical faults and stress and allow your feet to function with improved efficiency. Ø An effective foot orthotic transfers pressure away from high pressured areas to allow the corn to improve. Ø Advise patient to wear gloves while using a tool such as a garden spade or rake. If patients expose other parts of the body to friction, advise them to wear appropriate padding. For example, if you are on your knees laying carpet, wear knee pads. Ø Advise patients to wear shoes that fit well and are roomy, with wide and deep toe boxes (the area that surrounds the toes). – A wider toe box keeps the toes from pressing against each other, relieving pressure on soft corns. – A deeper toe box keeps the toes from pressing against the top of the shoe, relieving pressure on hard corns. – Toe caps and toe sleeves. Ø Soak corn in warm water and then using a pumice stone to lightly wear away the dead skin. 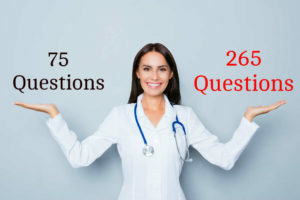 Ø Instruct the patient to never cut the corn on their own, especially if they have diabetes or other conditions that cause circulatory problems or numbness. Ø Referral to a podiatrist may be necessary. This entry was posted in Nursing Interventions and tagged corns, corns on feet, nursing intervention. Bookmark the permalink.